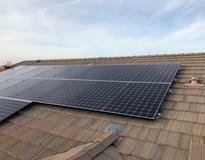 LG 320 panels x 28 with 10KW Solaredge inverter. My needs based on the last 12 months of electrical use were quoted by multiple providers at 44 panels but because the increase in our electrical use over the last year is not expected to last (I have 2 RV's on site with tenants) I decided to put in a smaller system. I have wanted to go solar for a while but it was so confusing. EnergySage.com helped me figure it all out and come to a decision on what panels to use as well as size of system. My main goal to getting it done now was to take advantage of the tax credit before it goes away. 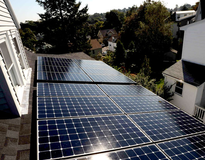 Do your research on Energysage and get multiple quotes. Compare apples to apples. Solar Symphony was great at presenting the information I needed without the pushy "sign now to get this rate" that some try to push off on you. Also, they did not bad mouth other companies in order to sway me to go with them (other companies did).